What do you do when you hit an animal on the road? Nobody wants to be involved in a road collision involving an animal, but unfortunately there’s not a lot you can do when a critter gets in your path and you’re cruising at high speeds. In fact, an online driving course will usually tell you that, typically, it’s safer to hit the animal than to swerve and get in a more serious accident. Though it’s possible you’ll never hit a deer or animal on the road, if you do, you’ll want to be prepared. 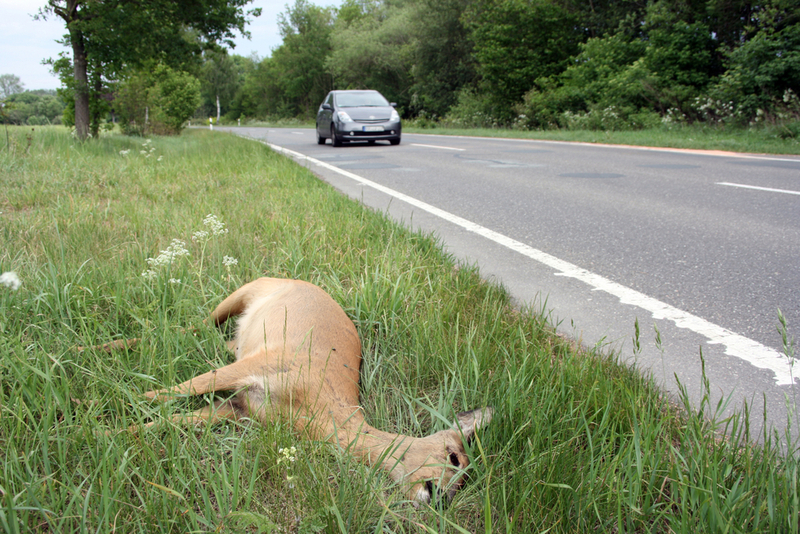 Here’s what to do if you hit a deer or other large animal on the road. If your vehicle is in the middle of the road, pull off immediately and put on your hazard lights. After you hit an animal, it’s not uncommon to be in a little bit of shock. First and foremost, make sure you and the other people in your vehicle aren’t hurt. Sometimes large animals can come through the windshield and cause serious injury. After determining that everyone is safe, don’t rush out to grab the animal, especially if you are on a busy road. Call the police, especially if the deer or large animal is in the middle of traffic and hazardous to other drivers. Depending on the damage to your vehicle or injuries sustained in the collision, you may need to fill out a report. The report will help with insurance issues as well. Do everything you can to gather evidence of the incident while remaining safe. Take some photos with your phone of the animal (from a safe distance) and also of the surroundings and of the damage done to your car. If possible, get accounts from witnesses and ask for their contact information. While it may be tempting to get out and help the animal, it can often be very dangerous to do so, especially if the animal is alive and happens to kick. Animal control can take care of it, and police can put their lights on to notify people the animal is in the middle of the road. Report injuries, send photos, do whatever your agent requires. The fresher the incident is in your mind, the better you’ll be able to report it. Also, the sooner you report damages, the sooner you can get the help you need. Don’t drive off before thoroughly checking your vehicle for leaking fluid, smoke, or missing parts. If you need, call a tow truck.